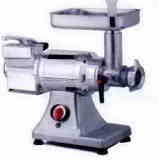 We have a variety of electric meat grinders to fill your meat processing needs. 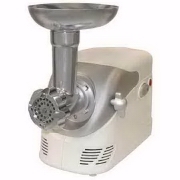 We have excellent homestyle grinders, medium-sized grinders for home processing of animals and game as well as heavy duty electric meat grinders for commercial-size grinding needs. 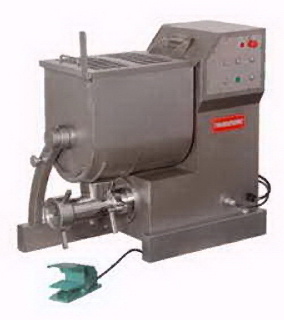 For that perfect sausage or hamburger meat the meat grinders at Heinsohn's are the ones to use. 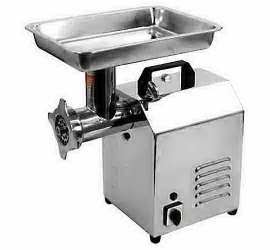 Some of these Grinder motors can be used to power meat tenderizers and vegetable slicers - so take that into consideration when purchasing an electric meat grinder. 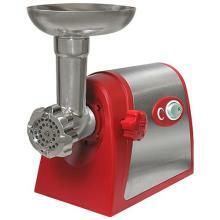 What type of Electric Meat Grinder are you looking for? 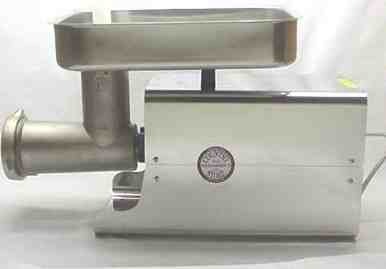 Includes shredder/slicer attachment to quickly slice cheese, fruit, nuts and more. This machine does it all for you! Makes life easier so that you have more time to do the things you enjoy. * 3 stainless steel grinding plates for fine, medium, and coarse grinds. * Sausage stuffing tubes included for perfect sausage every time. * Forward and reverse operation. * Includes the shredder/slicer attachment with three blades. * Fine shredder for cheese, garlic & nuts. * Slicer for cheese, vegetables & fruits. * Coarse shredder for potatoes, cheese & vegetables. The compact design stores easily and keeps your counter top free of clutter. Use the included Tomato Strainer Attachment to quickly and easily make healthy, homemade sauces, jams, jellies, wines, juices and even purees for baby foods. This Heavy Duty Grinder has a 400 Watt heavy duty motor and grinds up to 2.5 pounds per minute. Made of powder-coated cast aluminum for commercial quality in your home. Stainless steel cutting blade for added durability. Unit has a thermal reset button that provides overload protection. 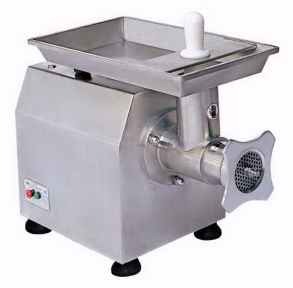 Includes pusher, large and small sausage attachments, stainless steel cutting blade and three sizes of hardened sintered steel cutting plates (coarse, medium, fine). * Has powerful 575 watt motor. * Will accept the shredder slicer below. * Will accept the Tomato Juicer below. * Sleek design with cord compartment for compact storage. This is really a great value, especially since it can also be a slicer, shredder, grater with the attachment below. Make fresh, delicious juices at home easily with tomato and fruit juicer attachment on your #699573 grinder!You will be surprised how well this attachment will help you. It will save you money, all you do is attach this to your grinder instead of buying a big juicer. A Great accessory for the #699573 This is one great grinder attachment that will save you time and money, just add this to your grinder anytime your ready to slice or shred anything. The Grinder Head is Made of Anodized Aluminium. Has Self-Lubricating Gears, Screw Propeller is Niploy-fused Cast Iron. Grinds meat as well as grates cheeses. Great for small restuarants or small butcher operations. Packing Size: 19" x 13" x 19"
This #12 500 Watt Heavy Duty Grinder has four-position switch (grind, stuff, off, reverse. 500 Watt heavy duty motor and grinds up to 6 pounds per minute. Made of powder-coated cast aluminum for commercial quality in your home. Stainless steel cutting blade for added durability. Unit has a thermal reset button that provides overload protection. All stainless steel motor housing. All metal gears with roller bearings. Heavy duty handle for easy moving. 110 volt. Has a permanently lubricated motor, built in circuit breaker, stainless steel knife, head, auger. Stainless meat pan 11-1/2" x 8-1/2" x 2-1/4" deep. Comes with 3 stainless steel plates: coarse (3/8"), fine (3/16") and, stuffing plates. Also has 3 sausage stuffing tubes (3/8", 3/4", 1-1/4") and a meat stomper. Weighs 36 pounds. 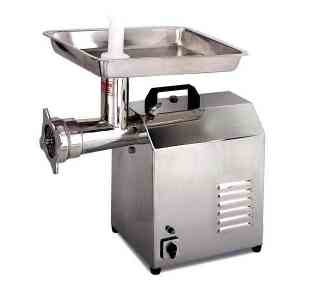 Ideal for grating all types of hard cheeses, for smaller sized jobs and businesses. Feeder handle interlock prevents grater from operation unless the handle is down. Hopper hand grill guard for operator safety and injury prevention. Direct gear driven motor longer wear with no belts or chains to replace. Stainless steel pan and grater drum for sanitary operator and easy cleaning. *Note: For grating hard cheese ONLY. 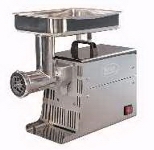 Comes with large stainless steel tray, pan, knife, plate, auger & head. Forward and reverse and resetable circuit breaker. 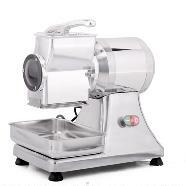 Has Hobart configuration so will use many of Hobart accessories including the meat tenderizer or the vegetable shredder attachments below. 1 horsepower motor 110 v.a.c. 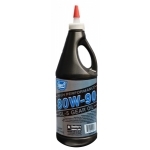 designed for heavy duty work and commercial food processing applications. Jerky/Fajita Cutter Attachment Head 1/4"
This attachment head effortlessly cuts uniform 1/4" strips of jerky or fajita meat. The chute opening fits 6 1/4" wide by 15/16" thick cuts of meat. Features include 52 rotating knives, 2 stripper combs and it is easily disassembled for cleaning & maintenance. It is compatible with ProProcessor #12 & #22 grinders & American Eagle AE-G12N or AE-G22N grinders. It can be used in most mixers and most motor units with Hobart #12 hubs. Pick one up for your butcher shop, restaurant, hotel buffet, food truck and more! This attachment head effortlessly cuts uniform 1/2" strips. If desired these strips can then be dropped through sideways to make small chunks of meat for soups, stews, chilies and more. The chute opening fits 6 1/4" wide by 15/16" thick cuts of meat. Features include 64 rotating knives, 2 stripper combs and is easily disassembled for cleaning & maintenance. 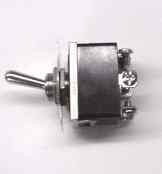 Attaches to grinders and mixers such as the American Eagle #12 (Item#699739), the Thunderbird (Item#699896), and the ProProcessor (Item#646335) or for more power (Item#646336) with the accessory attachment. See parts list for Tenderizers and Jerky Slicers here. Replacement grinder pan. Holds extra meat in preparation for grinding. Has a 2 1/4" Deep Pan. Measures 12 3/4" x 10 3/8". 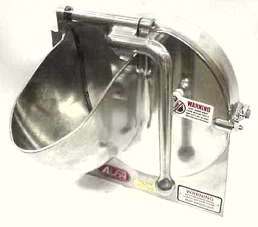 Attatches to Hobart style grinders and mixers such as the American Eagle #12 (Item#699739), the Thunderbird(Item#699896), and the ProProcessor (Item#646335) or for more power (Item#646336) with the accesory attachment. Comes with a 3/16" shredding disc. 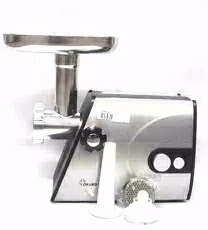 Thunderbird Electric Meat Grinder 120 v. ac. Grinds 5+ lbs/min. #12 plate & knife for larger jobs. Check out the Tenderizer attachment below! This attachment will fit the #12 meat grinder for American Eagle, ProProcessor and Hobart brands. It is ideal for skirt steak, boneless chuck, tough game meat, fajita meat and chicken breasts. Powerful 1 HP (MC12N) or 1.5 HP (MC22N) motor. 100% gear driven transmission with durable steel alloy gears. Permanently lubricated, sealed motor design for food safety and low maintenance. Heavy duty, buttom mounted combs prevent meat from becoming trapped between blades. Attractive, high polish stainless steel design with no sharp corners or seams for easy cleaning. 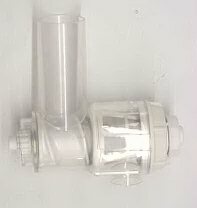 Extra large, 2" W x 3.75" L feed input chute. 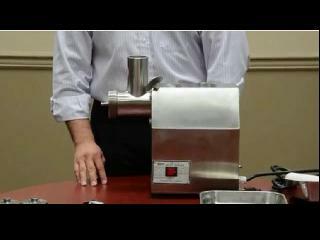 This attachment fits the #12 meat grinder for American Eagle, Proprocessor and Hobart brands. It is ideal for skirt steak, boneless chuck, tough game meat, fajita meat and chicken breasts. Extra large, 2" W x 3.75 "L feed input chute. Quick and uncomplicated - This unit is reliable and produces high amounts of ground meat while accomplishing the highest hygienic demands. Hopper and mincing unit can be easily disconnected from the whole body for thorough cleaning. 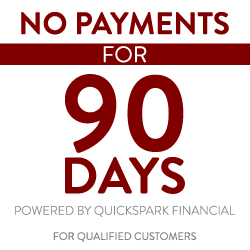 Reasonable price now means it is not just for professional use. 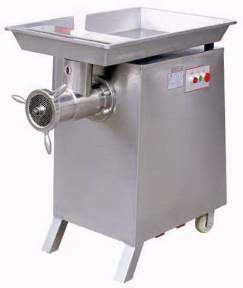 Has large stainless steel tray, pan, knife, plate, auger & head. Forward and reverse and resetable circuit breaker. 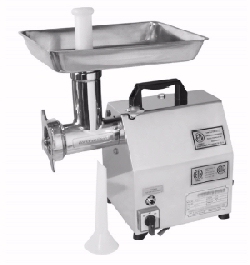 This unit will also interface with the American Eagle Meat Tenderizer head (600298) so you can have a dual-purpose machine that can tenderize and grinder with only a small additional investment. It has a 1.5 horsepower motor, 110 V.A.C designed for heavy duty work and commercial food processing applications. Professional high-performance for use in restaurants, hotels, communities and butcher shops requiring large quantities of minced products. Stainless steel feed box and meat pick-up tray. A set of two plates (1x 6mm, 1x 3mm holes) with a diameter of 99mm in combination with the stainless steel screw auger provides for an above-average high-speed, good quality and constant efficiency when cutting raw and cooked meat. 2 hp 110 V.A.C. Full One Year Parts Warranty. The biggest grinder available that is still 110 volts AC at anywhere close to this price. Has circuit breaker for safety. Includes hamburger plate & chili plate, stuffing tube, meat pusher. Excellent Power! Quality machine.Can be used to power 50 lb. 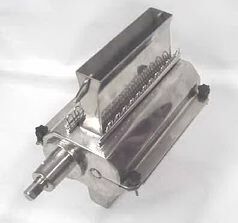 mixer on sausage stuffer page. tenderizer on Tenderizer page. This is one powerful grinder. All stainless steel chamber, designed to the latest US and EC safety standards. Single handle locking mechanism releases chamber for easy cleaning. Durable and heat free operation, easier to clean. These models have forward direction only and are stainless steel with 6mm & 8mm mesh plates & knife included! LARGE PAN approx. 34" x 21" x 4"
5 hp 220 V.A.C. 3 Ph. Full One Year Parts Warranty. This Grinder Can Put It OUT! 1500 lbs/hr! Has conventional 2" guard hole for pusher with large 4" throat below it. Connects to above steaker to # 10 - #12 Meat Grinders. Connects to above Steaker to #32 Meat Grinder. This handy patty maker attaches to any #32 grinder. Use it to make ground meat pattys, jerky, and snack sticks. Make professional burgers and sausage patties for yourself or your customers. Attach the unit to the grinder before you start grinding the second grind. Thread the waxed paper roll onto the chute and begin pushing the meat into the grinding head. As the meat extrudes from the patty maker it pushes the paper down the chute. Use the 11" meat shears provided to cut the patties any size you like. This all metal unit comes with 1 roll of waxed patty paper, meat shears, and 16" chute. It makes 1/2" patties or use the accessory plates included to make 3/16" x 1-3/16" jerky strips three at a time, 1/2" diameter snack sticks four at a time or 3/8" patties. Instructions included. This handy patty maker attaches to any #22 grinder. Use it to make ground meat patties, jerky, and snack sticks. Make professional burgers and sausage patties for yourself or your customers. Attach the unit to the grinder before you start grinding the second grind. Thread the waxed paper roll onto the chute and begin pushing the meat into the grinding head. As the meat extrudes from the patty maker it pushes the paper down the chute. Use the 11" meat shears provided to cut the patties any size you like. This all metal unit comes with 1 roll of waxed patty paper, meat shears, and 16" chute. It makes 1/2" patties or use the accessory plates included to make 3/16" x 1-3/16" jerky strips three at a time, 1/2" diameter snack sticks four at a time or 3/8" patties. Instructions included. This handy patty maker attaches to any #10/12 grinder. Use it to make ground meat patties, jerky, and snack sticks. Make professional burgers and sausage patties for yourself or your customers. Attach the unit to the grinder before you start grinding the second grind. Thread the waxed paper roll onto the chute and begin pushing the meat into the grinding head. As the meat extrudes from the patty maker it pushes the paper down the chute. Use the 11" meat shears provided to cut the patties any size you like. This all metal unit comes with 1 roll of waxed patty paper, meat shears, and 16" chute. It makes 1/2" patties or use the accessory plates included to make 3/16" x 1-3/16" jerky strips three at a time, 1/2" diameter snack sticks four at a time or 3/8" patties. Instructions included. This handy patty maker attaches to any #8 grinder. Use it to make ground meat patties, jerky, and snack sticks. Make professional burgers and sausage patties for yourself or your customers. Attach the unit to the grinder before you start grinding the second grind. Thread the waxed paper roll onto the chute and begin pushing the meat into the grinding head. As the meat extrudes from the patty maker it pushes the paper down the chute. Use the 11" meat shears provided to cut the patties any size you like. This all metal unit comes with 1 roll of waxed patty paper, meat shears, and 16" chute. It makes 1/2" patties or use the accessory plates included to make 3/16" x 1-3/16" jerky strips three at a time, 1/2" diameter snack sticks four at a time or 3/8" patties. Instructions included. This handy patty maker attaches to any #5 grinder. Use it to make ground meat patties, jerky, and snack sticks. Make professional burgers and sausage patties for yourself or your customers. Attach the unit to the grinder before you start grinding the second grind. Thread the waxed paper roll onto the chute and begin pushing the meat into the grinding head. As the meat extrudes from the patty maker it pushes the paper down the chute. Use the 11" meat shears provided to cut the patties any size you like. This all metal unit comes with 1 roll of waxed patty paper, meat shears, and 16" chute. It makes 1/2" patties or use the accessory plates included to make 3/16" x 1-3/16" jerky strips three at a time, 1/2" diameter snack sticks four at a time or 3/8" patties. Instructions included. Paper for above machine. Measures 4.5" x 240". Keep both hands free when stuffing casings or filling ground meat bags. 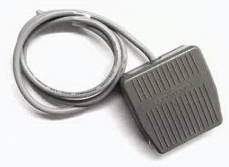 Just plug your grinder into this 15 amp foot pedal, and the 8 ft. pedal cord into any 110 volt outlet. Simply tap you foot to start and stop your grinder. 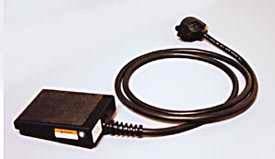 Can be used on stuffers and grinders that operate on 10 AMPS or less. 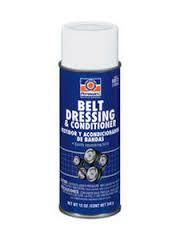 Stops squeeking of belts on pulleys and gears in your meat grinder. Pushes meat through grinder with your fingers safely out of the way. Measures 9" long and 4" deep & 1.6" in diameter. Measures 10" long and 7" deep & 1.8" in diameter. Measures 10" long and 5" deep & 1.8" in diameter. Measures 9" long and 5" deep & 1.5" in diameter. #5 and #8 Wooden pusher. Measures 5.5" long and tip measures 1 1/4" in diameter. Overall length 10 1/8". Bottom measures 2 3/8". Overall length is 10.25" and width is 2 7/16" with 5 1/4 long shaft. 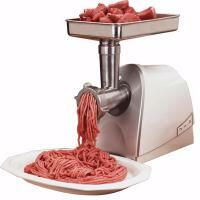 Your electric meat grinder will allow you to make anything from ground hamburger to ground sausage. You can change the plates to determine the size and style of the ground meat. 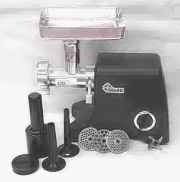 Many of electric meat grinders we carry are built for commercial use assuring a quality meat grinding experience.